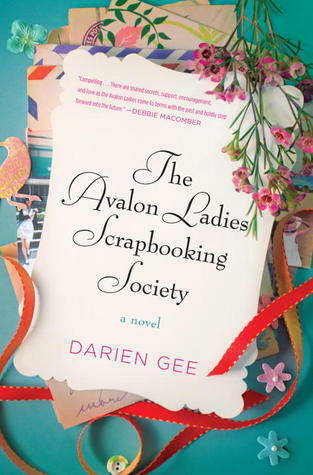 There are quite a number of wonderful ladies that are all interwoven in The Avalon Ladies Scrapbooking Society and I quickly found it was important for me to get them straight before I could really enjoy how their relationships unfolded. For this reason it did take me a few chapters before I was hooked. The feel of the novel for me was reminiscent of a Cathy Kelly or even a Maeve Binchy in that Gee put together strong characters and individual stories and wove them together into one novel set in a small town. The difference was of course the theme of scrapbooking which I really know next to nothing about. As a child we were given the task of creating a scrapbook of our holidays (to keep us busy during said holiday!) but the scrapbooking business of today is apparently a whole other matter. I was a bit lost when Bettie was explaining to her group about different types of kits for their books but it was still interesting to me and I loved that this brought people from all over the town to one common hobby- especially a hobby that focused on creating memories of the good things in their lives. It was so touching to see how they rallied around Bettie when she needed it and gave me a feel good vibe that the whole novel encompassed. There are actually so many women it’s hard to pin point one I liked the most- for some reason the one thing sticking out for me is the silly goat Serena that Connie is determined to love above everything else. A goat in itself is lighthearted where quite a few of the other storylines made me teary so there’s something for everyone and I’m sure everyone can relate to one of the Avalon Ladies. I even read all the Friendship Bread recipes!